Colors on the 55LS5700 are displayed well with a nice, realistic look. Colors are not oversaturated and warm tones and flesh tones look particularly good. Contrast and black level perfomance on LS5700 is above average, the black bars on the top and bottom of movies are a dark inky black but in dark scenes the black can overpower some detail in the picture. The dark black does give the 55LS5700 its strong color rendition. The LS5700 did a nice job with motion processsing.There was little to no jerky judder. 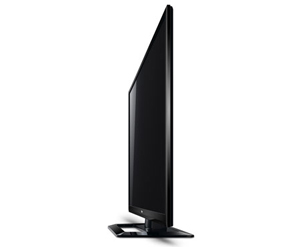 The 55LS5700 uses LG's 120Hz TruMotion, after much testing, we recommend locating this feature in the settings, tuning to the User setting and changing the Judder Reduction component completely off to 0, and Motion Blur at level 9 with the exception of sports programming or fast action in broadcast programming for which the feature actually adds quality. This tradeoff will produce lots of jerky judder but it's worth it. LG's Smart TV suite is also available on the 55LS5700 and includes the more than 1000 Apps the company now has along with the typical premium content channels some paid and some unpaid like Netflix, Hulu Plus, YouTube, MLB.tv, Facebook and Twitter. It's overall a very complete solution and enables lots of play time with unusual little Apps that users may or may not find worth the 3.99 cents to $5.99 that they usually cost. 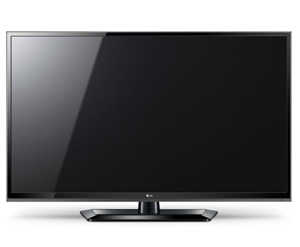 Included with the 55LS5700 is LG's innovative Magic Remote, also called the Magic Wand Remote. This secondary remotes operates using motion control. To interact with your TV you point the remote at the screen and move a crosshair with you wrist to select items on the menus or in the Smart TV suite. Without Stand: 49.7" x 29.7" x 1.4"
With Stand: 49.7" x 32.4" x 12.4"
The 55LS5700 sells for around $1400 from authorized resellers. That puts it at around $400 less than top tier Cinema series models from LG. The Sony KDL-55EX640 sells for the same price but I like the clear coat screen on the LS5700 much better as well as the Magic Remote and Menu system. The Samsung UN55ES6100 sells for $100 more and is also a good comparison but again, I like the clear coat screen on the 55LS5700 much better than the matte finish on the ES6100.